This weekend, as I pondered the many new knits I want to get onto the needles this fall, having finished all of the deadline knits I needed to get done over the summer, I decided on a plan of attack which involved starting on no new projects whatsoever. Nothing new could come onto the needles, I decided, until I finished the current pair of socks on the needles, and since they were already more than half done I just buckled down and finished them. And now, lo and behold, I have the next snazzy new addition to the sock drawer, ready for when fall arrives. (Which may not be for a while, if the coming warm weather forecast is any indication). These are my ribbed socks with Turtlepurl self-striping sock yarns, in ‘Poisoned Apple,’ and they are completely delightful. My only regret is that I didn’t make them a skootch longer on the leg portion (that ribbing does decrease the vertical length when it expands), but they’re pretty cheerful nonetheless. It is really a funny thing how yarn can sneak up on you when you’re not looking – I never would have thought I needed self-striping sock yarn in my life at the moment, but these colours are just so darned cheerful and I couldn’t resist. I even made sure the two socks matched, and everything. I finished these up on Saturday and since it was a long ‘holiday’ weekend, I decided to just keep it going and cast on a new pair of socks and knit as much of them as I could before the weekend was over. Then I got hit with an entirely miserable amount of sneezing and sniffling and it turns out being in an antihistamine fog isn’t super amenable to concentrated knitting time, but still – Socks That Rock Mediumweight is fast, and deep dark pink is hard to put down. This skein of Socks that Rock (‘Backstabber’ colourway), I realized, is actually the first skein of Socks That Rock I ever purchased, several years ago, and thus is probably one of the oldest skeins in my sock yarn stash. It turns out you CAN knit from your stash sometimes, who knew? And you know what else? it turns out that if you keep knitting socks, even just a few pairs a year, eventually your sock drawer will start to get full. I might actually need to start prioritizing sock drawer socks, and other-drawer socks. It’s a pretty great knitterly problem to have. I hope your September is off to a good start, knitter friends! What sock pattern did you use? 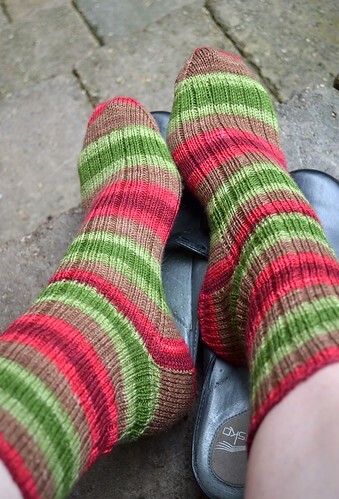 This is such a lovely basic rib sock. Love those stripey socks! The colors are so pretty. Love those shoes too…. I agree with Stefani, your shoes are perfect for showing off handknit socks. I’m impressed by the amount of progress you made before your allergies got the better of you. I was perfectly clear-headed all weekend, and yet I’ve ripped and re-knit the same pinky finger on a glove 3 times now without making any forward progress. I’m now questioning if the whole glove will have to be redone. Boo. You have excellent taste in yarn. The poisoned apple colorway is so pretty. That IS a good problem! The turtle purl socks look great. Exactly what you need to cheer up a gloomy day. Those Poisoned Apple socks are *awesome*. I have some fiber in that colorway, and am still not sure how to spin it to best advantage. You can bet I’m considering a self-stripe, though! Awesome looking socks. 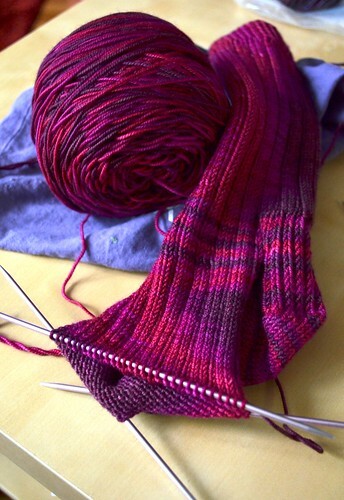 I’ve got a pair of self striping socks on the needles and it is way to fun watching these knit up. Good luck banishing the allergies and sorting that sock drawer. 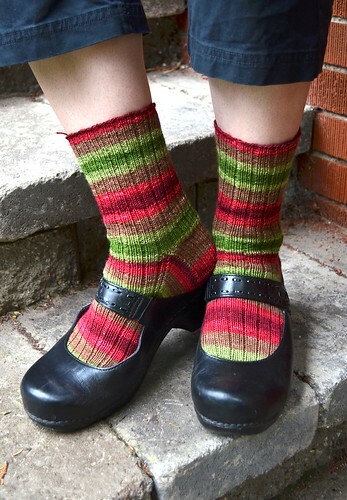 Just saying, If you need a sock pattern Glenna’s ribbed sock pattern is THE best. I’ve knit multiple pairs. I was starting to notice a sock problem the last time I cleaned and organized my sock drawer. Not enough room for TWO sock drawers. Obviously can’t get rid of hand made socks. So bunches and bunches of store bought were summarily retired. Thank you for the lovely sock pattern. I’m anxious to try my first pair of socks! But, a new-knitter-question, if I may: you said, “I even made sure the two socks matched, and everything.” So, how in the world does one do that?! I just finished a pair of your Nice Ribbed Sock(s)! Turned out great! I’ll use it again. Very nice socks, lovin’ the colors! I LOVE your Nice Ribbed Sock pattern; it’s a good thing I don’t have a trace of second sock syndrome, because I’ve made at least a dozen pairs. I’m grateful to you every time I cast on for another pair. Love those colors! Beautiful socks = happy feet! I did just about the same thing this last weekend. I gathered up one pair of socks that only need the afterthought heels. I also grabbed two sets of sock yarns that I have had waiting for way too long. And, I put my current pair of socks in a nice little bag that is now in my large purse. All I do is knit toe-up on double points around and around and around. I put in a holder for the afterthought heel and continue around and around. It is so soothing. The Nice Ribbed Sock pattern has become my favorite. Have made several pair and they fit perfect. LOL! Isn’t it always that missing ‘scootch’ that bothers? Can you share how you make sure to match the stripes in a self-striping yarn. I’m halfway through my first pair of handknit socks and I’ve seen two different bloggers mention “matching up the stripes” and I’m wondering how to do this. Thanks! They are awesome! Love the colourways! Thanks for including the skills required on your pattern! Looks like I have another skill to learn before I’ll be ready for tackling socks. 🙂 I LOVE both pairs of yours! I dont know how to knit (actually on monday a friends mom is going to show us some basics) and I love your blog…I am following it for sure!!! I love that you are “a crazy lady” tooo!! !